Since being established in 2002, Perfect Stix LLC has offered the highest quality wooden products, using only A Grade white birch wood. Perfect Stix LLC has become The Premier Wood Supplier in the ice cream industry, concession industry, food service industry, medical industry, cosmetic industry, craft industry, paint industry and spa industry. We offer a wide variety of wooden products such as ice cream sticks, ice cream spoons, taster spoons, bowtie sticks, medical spoons, medical sticks, cotton tip applicators, tongue blades, tongue depressors, coffee stirrers, candy apple sticks, corn dog sticks, meat skewers, fruit skewers, lollipop dowels, cake dowels, craft sticks, paint paddles, fan handles, specialty sticks, spa sticks, eyebrow sticks, cuticle sticks, waxing sticks, popsicle sticks, corn dog sticks, and caramel sticks. Perfect Stix LLC recently launched a full line of compostable products. We offer a wide variety of paper straws, wooden cutlery, and wooden and palm plates. These items are Earth-Friendly and are Compostable. Our customers believe in high quality wood products, however we believe in more. Perfect Stix LLC is setting the standard for your wood product needs. In just a short time we have revolutionized the industry with our high quality products and our great customer service. Perfect Stix LLC products are meticulously crafted with 100% white birch wood and are produced in an ISO 9002 Registered Facility. Our wood products are great for environment. 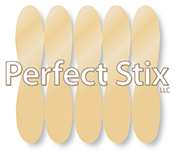 Our products are of such high-quality, that we had to name ourselves Perfect Stix LLC.